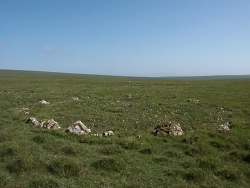 Zoom imageStone circle Fetlar has been inhabited since prehistoric times, and there is evidence of settlements from a range of periods at various points on the island. Examples include the Haltadans stone circle (probably from the early Bronze age), Neolithic cairns on Vord hill and "Da Giants Grave" a Viking Boat burial, the excavation of which was featured on the popular TV series "Time Team". Fetlar was one of the first landing places for the Norse settlers when they made their way across the North Sea, before moving on to other parts of Shetland, Iceland, Greenland and even America. Evidence of the production of steatite bowls used by them can be seen Strandibrough and Klemmel Geos near Houbie. Fetlar's population reached a recorded high of around 860 in the first half of the 19th century, after the Napoleonic wars had finished but before the effects of the clearances. However, as the 19th century progressed the clearances began to have a major effect on the island, as actual homesteads were cleared. To add to the troubles of the island, the failure of the Haaf fishing towards the end of the 19th Century had a devastating effect. As Fetlar has no natural harbour there was nowhere for larger boats to be kept year round in safety. This meant the population were now almost totally reliant on crofting which, without the fishing, made things extremely difficult. As a result, the population continued its steep decline. Zoom imagePeat cutting Photo courtesy of Fetlar Museum Trust. 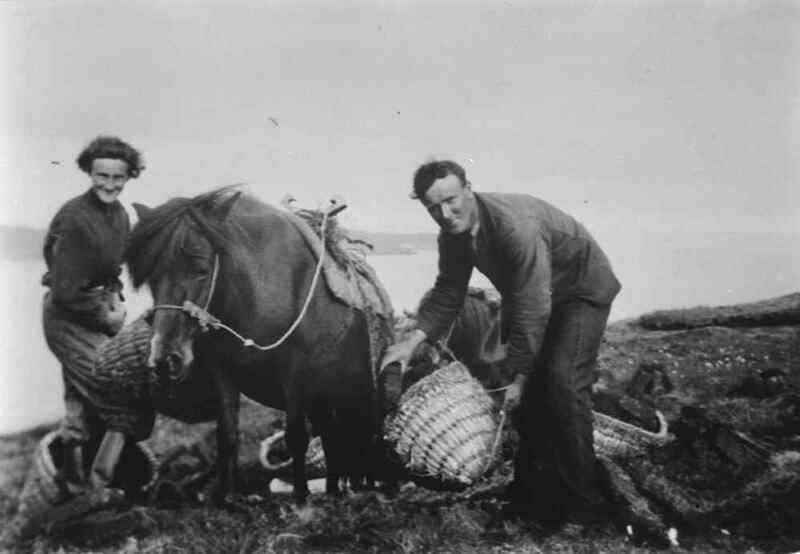 In Fetlar there was a great tradition in using horses and ponies to flit (transport) peats mainly from Lamb Hoga to the crofts on the west side of the island. Those living on the east side would take their peats them down to the and then transport them mainly to Aith by open boat. In latter years some people also cut peats on the island of Hascosay which lies between Fetlar and Yell. Again these were transported back to Fetlar by boat. Until the early 20th century, guizers in Fetlar known as Skeklers dressed in straw costumes with pointed hats, and went around houses at Hallowe’en or New Year. Guizing was a popular form of entertainment, where groups of people dressed in fancy dress went around the houses in the island asking to be let in for refreshment. Some of Fetlar’s fiddle tunes are amongst the oldest in Shetland. The most famous of these are Winyadepla and Haltadans. Many of the fiddle tunes are reputed to have been learned from the trows (Shetland little people who live in hills). 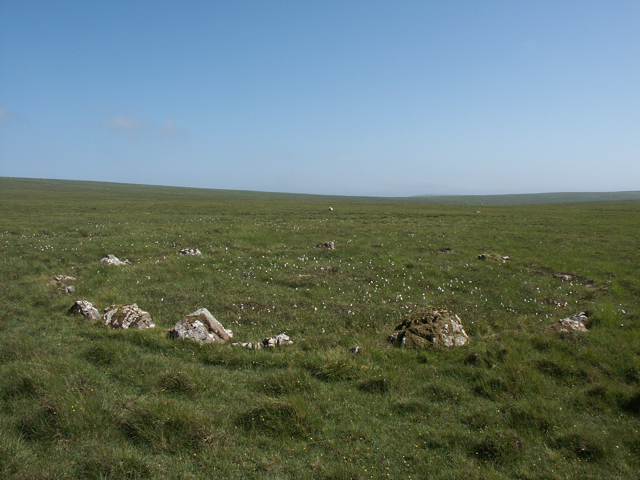 A famous account of the origins of the name Haltadans - an ancient ring of stones in the centre of the island - tells how the Trows were dancing one night and took a fiddler and his wife from the local people to play for their dancing. They danced a limping dance in a circle, which is the meaning of the word "Haltadans", but so enjoyed themselves that they were unaware of the sun coming up, and they were turned to stone at sunrise. The fiddler and his wife were also turned to stone and appear in the middle of the circle. 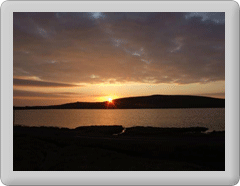 Fetlar is also rich in stories and folklore. 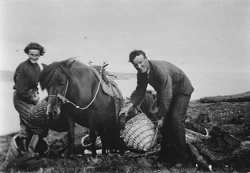 The Fetlar Interpretive Centre has extensive recordings of many stories told by Jeemsie Laurenson a well known local story teller and man of legendary strength. Historic houses on the island include Brough Lodge and Leagarth House. Although neither are open to the public, they can easily be seen from the road. Zoom imageBrough Lodge. Photo courtesy of David Gifford. Brough Lodge was home to the Nicholson family who were responsible for many of the clearances on Fetlar during the 19th Century. The house was recently bought by the Brough Lodge Trust, who are commencing work on restoring the grade 1 listed building to a wind and watertight state in the near future, having secured a considerable amount of funding. It is hoped that once this work has been completed that a long term plan for the building can be finalised. Leagarth House was completed in 1901 for Sir William Watson Cheyne who assisted Lord Lister during the development of antiseptic surgery. He was an eminent surgeon in his own right and was at one time the president of the Royal College of Surgeons as well as serving as an MP. He undertook a significant amount of unpaid medical work in Fetlar and in the other North Isles for people who would otherwise been unable to afford surgery. This charitable work earned him a great deal of respect within the community. For a considerable number of years he and his descendants allowed the hall attached to Leagarth house to be used by the community for dances and other events.In 2009 work began on an extensive refurbishment of the house by his family who are aiming to fully restore Leagarth House and bring it back into use. Further information on many of these topics can be found by visiting www.fetlar.com or calling along the Fetlar Interpretive Centre.